Saturday night, we'll bring the first of a series of broadcasts of the Saint Paul Chamber Orchestra live from the Ordway right here on Classical Minnesota Public Radio and I am thrilled to be a part of it! 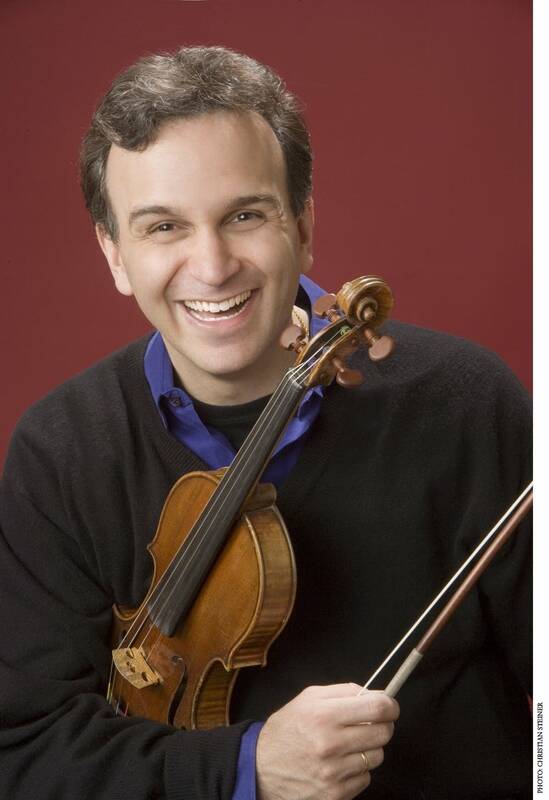 Israeli-American Violinist Gil Shaham is the soloist playing two concertos by Haydn and Mendelssohn. He makes his first appearance in eight years and it will surely be a night to remember. I went to rehearsal this morning and was bowled over by his virtuosic playing that seems so effortless, full of energy and life where the music just spins out. But I was also taken by his personality, one so utterly full of joy when he plays, he makes the performance great fun. There's also kind of gracious generosity with his playing. Even if Gil is intently looking down, his ear close into his Stradivarius and his body swaying in time, he is ever present in the moment and you feel lucky to be sharing in this moment. Since the orchestra will perform without conductor, Gil and Concertmaster Steven Copes have worked out leading the orchestra in a more chamber music style - with a look, a breathe, a lifted eyebrow, and sometimes a grander gesture like an upbow. It is a wonder to behold a stage full of musicians coming together as one organic whole without the benefit of a single baton. The concert takes on classic proportions with Haydn, Beethoven and Mendelssohn, but each piece has is unique and distinct for its day. I was completely unfamiliar with Haydn's second violin concerto until I heard Gil Shaham's latest disc with the Sejong soloists. Haydn wrote it for his concertmaster and it's filled with delight and - according to Gil - falls nicely into the hands of a violinist. You will weep in the touching second movement and possibly grin during the short, fast final movement that feels more like a quirky CPE Bach symphony, than a more stately Haydn concerto. Beethoven's Symphony No. 2 was written at the moment Beethoven knew there was no curing his deafness, yet it is an amazing gift of unrelenting happiness, chock full of shocking sforzandos and crashing melodies that banish all thought of symphonic writing before and move music into a new epoch. In Mendelssohn's Violin Concerto, we're ushered into another new era of romantic writing. It's a piece that took Mendelssohn six years to write, even though he supposedly was unable to get the first tune out of his mind the moment he planned to write a concerto for the concertmaster of his orchestra, Leipzig's Gewandhaus. The piece pushes the violin in new directions, tries out new techniques and captures both the solemn and the Puck-ish characters Mendelssohn possessed. This is a concert not to be missed! I hope you'll tune in Saturday at 8:00.